A few years ago, I was given a proof copy of what was then Christos Tsiolkas’s latest novel, Barracuda. I found myself soengrossed in the story that I couldn’t put it down and I ended up spending a whole day in front of the fire reading! When I discovered the ABC had turned the novel into a miniseries, I was naturally super keen to watch it and I must say I wasn’t disappointed. Brought to us by the same creative team that adapted Tsiolkas’s award-winning novel The Slap, Barracuda is the story of Dan Kelly (Elias Anton). Kelly comes from a working class background, but wins a sporting scholarship to a prestigious private school. 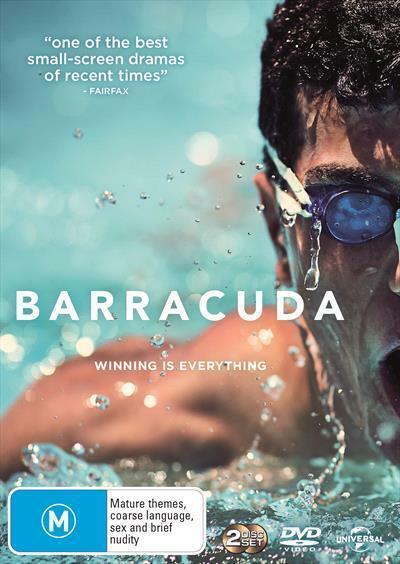 Initially, he is taunted by his peers, but soon wins their respect (and earns the nickname ‘Barracuda’), by proving himself in the pool. Kelly dreams of winning gold at the 2000 Olympics, encouraged by his coach (Matt Nable) and swimming team mates, especially his friend (and love interest), Taylor (Ben Kindon). Kelly has all the arrogance of youth and fails to appreciate the sacrifices his family make in order to support his dreams. Moving in the circles of his privileged friends, Kelly starts to judge the working class life of his parents. It is only when his dreams turn sour that Kelly learns some kind of humility. While we don’t get the same insight into the main character in the screen adaptation as we do in the written work, I do think the miniseries manages to capture the essence of Tsiolkas’s novel and it certainly brings to life the suburban setting. It was great to see the trams, the streets and the swimming pools I know so well on the TV screen. If you enjoy gritty Australian drama, then I can highly recommend this DVD.